A quick trip for pizza. Parking the car, saw this building way behind the shop. Liz the pizza lady was nice to us, though I'm not supposed to tell anyone. I was still scared to ask her to let me take a picture for the blog. I'm going to have to get over that! Totally cool shot. The window without the reflection would have done it for me, but the reflection takes it to another level. Beautiful photo, Jenny! Don't worry, we won't tell anyone that Liz let you take the pic ;). PS: Thursday I'm showing one of Boston's most famous sites, come take a look. 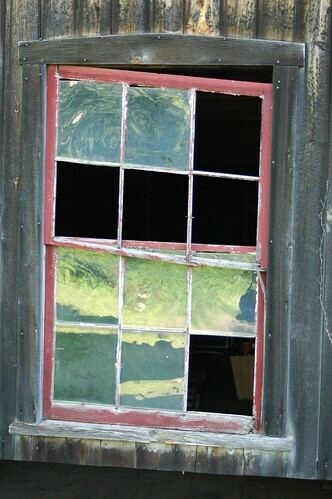 What a wonderful window! It has so much character. I must get over my "shyness" too when asking permission to take photos for my blog! We have a guest's photo in the Guelph blog today!